Farm Fresh to You is one of the Bay Area’s best CSA programs. I’ve become addicted to the $25 10lb fruit and vegetable box arriving bi-weekly with an exciting array of organic produce that was harvested less then 48 hours before being delivered to my doorstep. Having 10 or 20 pounds of vegetables dropped off at your home weekly or biweekly may seem like a daunting prospect. However, when you have the flexibility of excluding vegetables you may not care for, or that you grow in your own garden, using all of the items in your box becomes less of a challenge. Between 2 people, the 10lb’s of FFTY produce is typically polished off within 5 days. Another plus is that FFTY allows customers to cancel or postpone their service at any point in time. The website makes it easy to control your orders and check what items will be included in your box for the week, so that you can plan your grocery and farmers’ market purchases accordingly. Featured: Produce from the November 2nd 10lb “small mixed fruit and veggie” box. *Check out their gourmet grocery store in the Ferry Building. This recipe, adapted from the book Gluten Free and Easy by Robyn Russell, combines a whole roasted pumpkin with lasagna. It requires quite a bit of prep time if you don’t have tomato sauce already made. It’s a good idea to start cooking on a Sunday afternoon so there’s plenty of time to finish before dinner time. Enjoy leftovers for the rest of the work week. To roast the pumpkin, preheat the oven to 350 and fill a Pyrex baking dish with about 1/4″ of water. Cut the pumpkin in half vertically and scoop out the seeds and fibers (reserve seeds to make a delicious snack later). Place pumpkin halves face down into the prepared Pyrex dish. Roast for 30-40 minutes. While the pumpkin is roasting, start the tomato sauce (bonus if you already have a good tomato sauce made- this will save time and the lasagna will be more flavorful with a sauce that’s had time to sit at least overnight). To make the sauce, heat the olive oil on medium. Add the diced onion and the mushrooms, cook 3-5 minutes. Add the 2 cloves minced garlic and saute 1-2 minutes more. Scoop the tomato paste into the pot and mix well with onion, mushrooms and garlic- then add the canned diced tomatoes and tomato sauce. While bringing this to a boil, add oregano or italian seasonings, a handful of chopped basil, salt, pepper, and maybe a splash of red wine. Once at a boil, reduce to simmer for at least 30-40 minutes. While the tomato sauce is finishing up, bring a large pot of water to a gentle boil and place the Tinkyada lasagna noodles in, stirring occasionally for 7 minutes. DO NOT follow cooking instructions on the box or you will end up with a very mushy lasagna. The noodles only need to be cooked a maximum of 7 minutes, trust me, I have made the mistake of overcooking them more then once! Drain noodles carefully and rinse with warm water, gently separating the sheets. While the lasagna noodles cook, whip up the white sauce by melting the butter in a small saucepan, adding the heavy cream, heating for about a minute, and then whisking in the flour or cornstarch. Whisk together until smooth, and then add the Parmesan cheese. Stir and set aside. Remove the pumpkin from the oven if you haven’t already, and scoop out its contents into a large mixing bowl, discard the shell. Add the ricotta cheese and stir until well mixed. Fold in a handful of chopped basil, 2 cloves of finely diced garlic, salt and pepper to taste. Set aside. Now that you have all of your components, spread a couple heaping tablespoons of sauce on the bottom of a clean Pyrex dish. Layer 3 noodles across the bottom of the pan. Spread 1/4 of the pumpkin ricotta mixture (about 1 cup) over the first layer of noodles then spread about 1 cup of your tomato sauce on top and sprinkle a handful of Parmesan cheese. Repeat these steps until you run out of noodles. 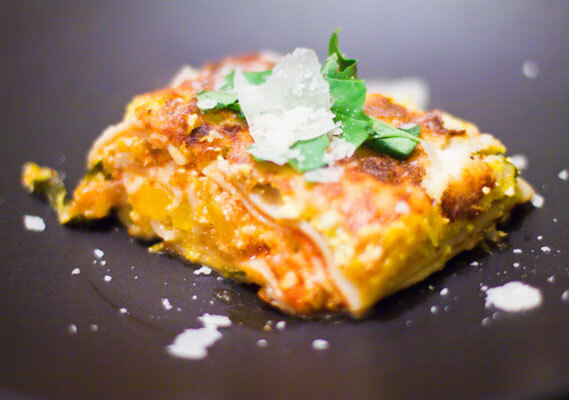 End with the ricotta-pumpkin mixture and spread the white sauce evenly atop lasagna. Place into a 350 degree oven. Cook for about 40-50 minutes, or until topping is nicely browned. Garnish with fresh Parmesan and basil.